Walkinshaw Andretti United’s Scott Pye scored a maiden Supercars win in a thrilling mixed weather encounter at the Coates Hire Supercars Melbourne 400. The South Australian gambled on the weather as rain fell midway through the race, opting to avoid a switch to wet tyres and keeping his composure in the tough conditions to take a narrow win 0.2612s ahead of Jamie Whincup (Triple Eight) and the fast charging Nick Percat (Brad Jones Racing). The gamble appeared to backfire for Pye and the leading pack, with rain falling heavily and the majority of the field switching to wets with five to go. However, the Holden driver was able to keep his car on track in the low light and wet environment and hold Whincup behind to claim an emotional win for driver and team. “Has to be (the best drive of my career), it’s my first win,” said a clearly emotional Pye. “Just speechless, (it’s a) really special moment and thanks to all the boys – mega job. Holden entries dominated the final results, with Tim Slade (Brad Jones Racing), James Courtney (Walkinshaw Andretti United) and Craig Lowndes (Triple Eight) securing the top six positions. Ford drivers Mark Winterbottom (Tickford), Will Davison (23Red) and Cameron Waters (Tickford) were next in line with Chaz Mostert securing 10th place as the first runner on wet tyres. Tim Blanchard (Brad Jones Racing) scored his highest finish of the year in 11th after also staying out on slick tyres. Championship protagonists Fabian Coulthard (DJR Team Penske), Shane van Gisbergen (Triple Eight), David Reynolds (Erebus) and pole-sitter Scott Mclaughlin (DJR Team Penske) finished in positions 12-15 after all stopping for wets. In a frantic opening to the race, Whincup moved from fourth of the grid to the outer limits of the track and was pushed onto the pitlane exit before settling into third behind McLaughlin and Pye. Percat was the biggest loser at the start, dropping from second to fourth and locking his front wheels going into the first corner while the rest of the field made it through the tight opening section unscathed. McLaughlin’s run at the front was limited to a single lap, with the Kiwi making an error going into the first turn on the second lap, overshooting the corner and cutting through the grass. The mistake dropped him from first to sixth and handed the lead to Pye in WAU’s second round since its new ownership structure and a test of the 28-year-old’s nerve. Reynolds starred in the early running, moving from ninth to fifth as the field settled into a rhythm ahead of the first stops and continued to prove Erebus’s outright speed this year. Racing in low light conditions after a late finish to Formula 1 qualifying, drivers were reporting spots of rain on the track after five laps, forcing teams to balance taking the potential undercut during the stops against the possibility of rainfall. Mostert and the car #55 crew were the first to blink, stopping on Lap 8 from seventh place on track. Coulthard, Caruso, Reynolds and Waters all stopped during the same period, with an issue changing tyres costing the DJR Team Penske driver time during the stop. Pye and Whincup both entered the pits at the same time, forcing a shootout between the rival Holden squads. With Pye re-emerging further ahead of Whincup, the move consolidated the South Australian’s effective lead and his best shot of a first-time victory in the Supercars Championship. After radio issues between the team and drivers, McLaughlin stopped on the same lap and exited the pitlane ahead of Reynolds. The loss was compounded for Erebus, with the team copping a $3,000 fine and a loss of 30 points in the Teams Championship for an unsafe pitstop. Both Brad Jones Racing cars mirrored their strategy from the Friday race, opting to keep all three drivers out longer than the majority of the field. Percat was serviced at the end of Lap 12 and kept track position ahead of Coulthard with fresher tyres. Slade stopped on the following lap, leaving van Gisbergen out in front after qualifying 17th. The move propelled the Kiwi up to 12th plays and the opportunity to attack with newer tyres in the closing stages. 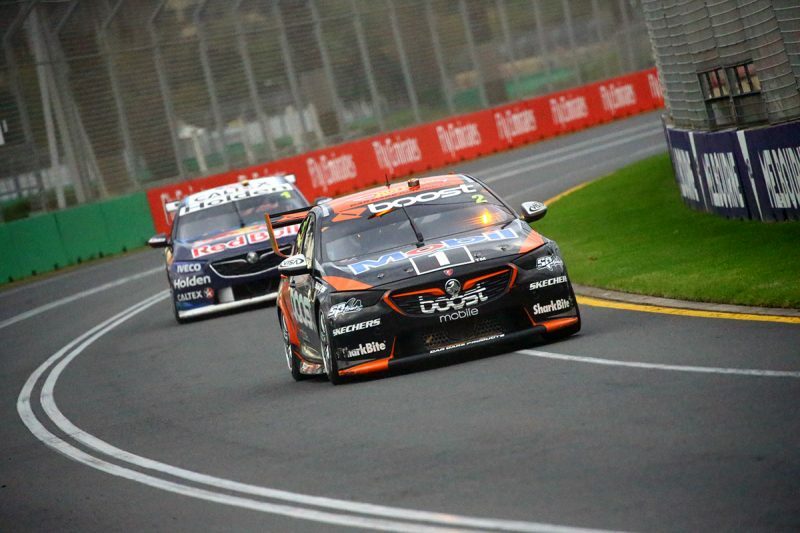 Lowndes’ tough day at Albert Park continued, making contact with both James Courtney and van Gisbergen. Courtney was given a five-second post-race time penalty for the incident. Pye built a four second advantage over Whincup and underscored his speed by setting a 1:56.9845s lap that was fastest at the time. However, the threat of rain returned with eight laps remaining. With the race declared wet lap times blew out as the rain fell harder on the circuit with teams continuing to gamble whether to make a switch to wet tyres or not. The call was split among the field, with Mostert, Coulthard, McLaughlin, Reynolds and Tander all opting for the wets with five laps remaining. The decision proved immediately risky, with a number of cars struggling to stop on the concrete apron during the pitstops as the intensified rain made the surface slippery. Pye, Whincup and Percat were among those opting to stay out on track, with the rain easing on circuit but conditions remaining slippery. A late race error by Pye saw Whincup close right up on the rear bumper of the Walkinshaw driver with two laps to go. Pye was able to hold his nerve and close out the win that was attended by new team owner, Zak Brown. “I’m happy to be here, I’m going to come more often,” said Brown. The final race of the Coates Hire Melbourne 400 is scheduled for 1345 local time/AEDT.